Located at the top of the grand staircase. The Morris & Gwendolyn Cafritz Foundation Theatre, the most intimate of our performing spaces, acts as a catalyst for new and exciting exploration in the art of theatre. This versatile black box theatre can accommodate patrons attending performances, lectures or meetings and is also used for classes, private receptions or seated dinners. The Morris & Gwendolyn Cafritz Foundation is the largest private, independent, local foundation focused exclusively on the Washington, DC metropolitan area. Calvin Cafritz, the eldest son of Morris and Gwendolyn Cafritz, has served as Board Chairman of the Foundation since 1989 and as President and CEO since 1993. Under Mr. Cafritz’s leadership, the Foundation has awarded more than $284 million in the program areas of Community Services, Arts and Humanities, Education, Health and the Environment. 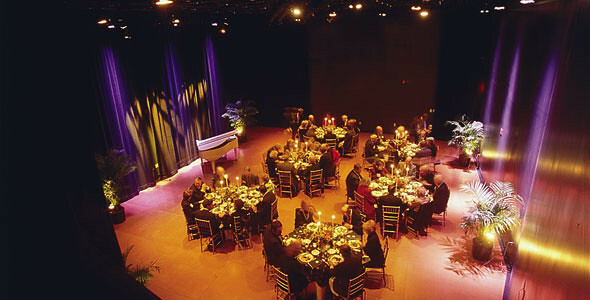 For technical specifications of the Cafritz Foundation Theatre, click here.